We just bought a 2013 Nissan Leaf. Like many things, I was at work when it went down, so I haven’t even seen the car yet! But I’ve been reading all about it, and without a doubt, charging the car is the biggest drawback to owning one of these things. You’ll get 240 volts through there, and a lot more amps. If you have an electric clothes drier, it will be plugged into a 240V plug. 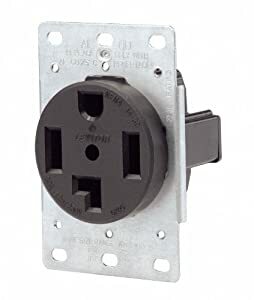 Those plugs might look like one of these, NEMA 14-30 (14 is the style, 30 is amps the wires attached to it are rated for) or NEMA 14-50. You can plug your electric car into one of those plugs too with the proper charging cable. See link for EVSE Upgrade website link below in bibliography. Or buy an upgraded L2 charging cable off eBay $379 + s/h. Level 3 Charging As you’re planning your day, you should be aware of where you can get a quick charge, should you need one. The app and website, plugshare.com, is a one stop shop for where these things are. I’ve used the L3 Quick Charger at REI in Seattle twice now, and it’s been awesome. That one is operated by EVgo. Speaking of which, get a bunch of charging cards. They are cheap and easy to get. Just sign up for the pay as you go versions. I think we’ve used the EVgo and the Chargepoint so far. But it’s nice to have them already if you need them. I chucked them in the center console. L2 Charging at home I recently got a wall mounted EVSE (electric vehicle service equipment) called a Juicebox. The Pro version is wifi enabled. I really enjoy being able to track numbers over time. How much electricity am I using to get from A to B in the Leaf? What’s it cost me? How much is it saving me vs driving a gas car? Once you put in your electrical rates, and local gas prices, this wall-mounted EVSE figures all that out for you – and that’s fun! At the moment, I have my Juicebox plugged into a NEMA 14-30 plug (the four-prong outlet in the pic above. This is a problem because the Juicebox can pull up to 40 amps, so the plug only fits a NEMA 14-50 (50 amp capacity outlet). But, emotorwerks (makers of Juicebox) also sell a short pig-tail adapter. Then, I went into the boxes web-interface, and told it to not draw more than 24 amps. Problem solved – until I can get a 50 amp plug installed, and I can uncork the Leaf’s on-board charger, and the Juicebox EVSE and charge as fast as possible at home. Pizza story I was down at work, and wanted pizza. I called my wife, and asked if she could pick up some pizzas and bring them down. She said: sure, but the car is almost out of juice, so I have to go home for an hour or so to charge up, then I’ll bring you pizza. True story. It can happen! With a car that can only go 70 miles before needing a charge, you’ve got to plan your days. Not a huge inconvenience when you consider the gas you’re not burning, in my opinion.